Z.S. Liang, born in China in 1953 and raised in a family of artists, published his first painting at age six in a children's magazine. His art education spanned two continents, beginning at the Central Academy of Fine Art in Beijing and continuing to the Massachusetts College of Art and Boston University. His award-winning paintings hang in both corporate and private collections around the world. 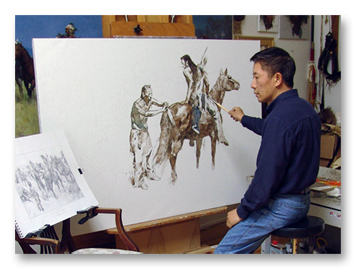 Liang received his first great inspiration in this country while studying and painting the Wampanoag Indian culture at the Outdoor Museum in Plymouth, Mass. 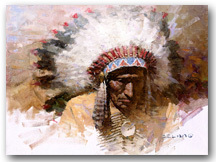 This newfound interest fired his imagination and he began to focus his painting primarily on the Native American Indian culture and their traditional way of life. During the ensuing years of field research, he has made many connections and friends among the native people, from the East Coast to the Rocky Mountains. His richly detailed, dramatic paintings are meticulously researched for historical accuracy. Among the many awards Liang has received are the Best of Show and People's Choice at the American Society of Portrait Artists, the Arthur Ross Award for Painting at the Classical America New York, and the Lila Acheson Wallace Award for Painting at the Society of American Illustrators. Exceptional technical prowess combines with a passion for his subject matter in these masterful works by artist Z.S. Liang.